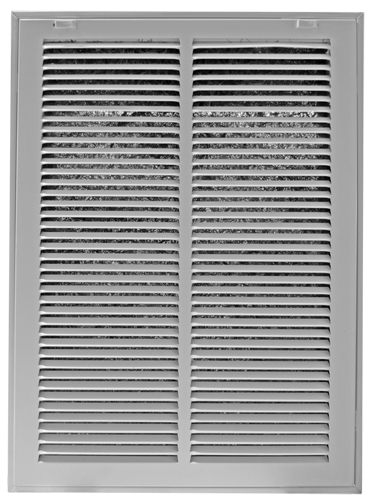 14 x 25 White Steel Return Air Filter Grill Discounts Apply ! Looking for a steel grille as a clean air solution? Look no futher, as this steel grille is an economical clean air solution for both office and home installation. The white faceplate of this steel grille is lacquer sealed and removes easily to allow for quick and easy filter replacement. This 14 x 25 steel grille will fit easily into a standard 14 x 25 hole in either the wall or the ceiling, providing you with an economical clean air solution. The frame of this steel grille is constructed of sturdy stamped steel and will accommodate a standard 1" filter, available at local hardware stores. Please note that this steel grille is not intended for floor installation and does not come with a filter. Also available are return air grilles without filters.